What can you do to make sure bank does not deduct TDS on interest, if your total income is not taxable? Banks have to deduct TDS when your interest income is more than Rs.10,000 in a year. The bank adds deposits held in all its branches to calculate this limit. But if your total income is below the taxable limit, you can submit Form 15G and 15H to the bank requesting them not to deduct any TDS. Forgot to submit Form 15G or Form 15H? Form 15G and Form 15H are forms you can submit to prevent TDS deduction on your income, if you meet the conditions mentioned below. For this, PAN is compulsory. Some banks allow you to submit these forms online through the bank’s website. Form 15H is for senior citizens, those who are 60 years or older; while Form 15G is for everybody else. Form 15G and Form 15H are valid for one financial year. So, please submit these forms every year at the beginning of the financial year. This will ensure the bank does not deduct any TDS on your interest income. A lot of taxpayers forget to submit Form 15G and Form 15H on time. In such a situation, the bank might have already deducted the TDS. Based on your situation, you can do any of the following. Most banks deduct TDS every quarter. If you forgot to submit Form 15G or Form 15H, don’t worry. Submit it at the earliest so that no TDS is deducted for the remaining financial year. While these forms can be submitted to banks to make sure TDS is not deducted on interest, there are a few other places too where you can submit them. TDS on EPF withdrawal –TDS is deducted on EPF balance if withdrawn before 5 years of continuous service. If you have had less than 5 years of service and plan to withdraw your EPF balance of more than Rs.50,000 (Rs 50,000 effective 1 June 2016, Rs.30,000 prior to that), you can submit Form 15G or Form15H. However, you must fulfil conditions (listed above) to apply for these forms. It means the tax on your total income including EPF balance withdrawn should be nil. TDS on income from corporate bonds –If you hold corporate bonds, TDS is deducted on them if your income from them exceeds Rs 5,000. You can submit Form 15G or Form 15H to the issuer requesting non-deduction of TDS. TDS on post office deposits –Post offices that are digitised also deduct TDS and accept Form 15G or Form 15H, if you meet the conditions applicable for submitting them. TDS on rent – TDS is deducted on rent exceeding Rs 2.4 lakh annually. 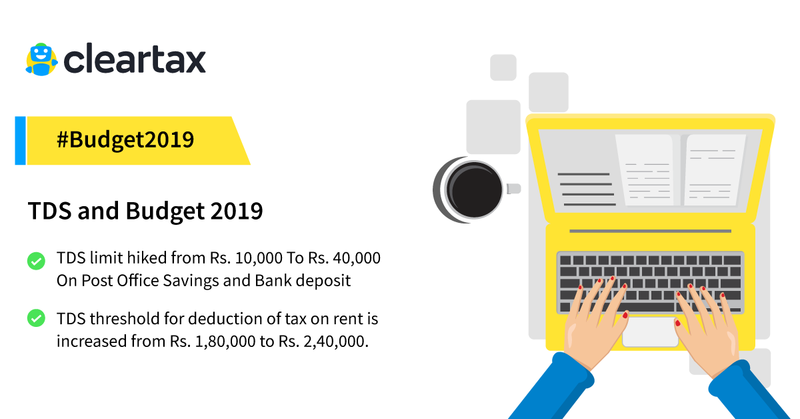 If tax on your total income is nil, you can submit Form 15G or Form 15H to request the tenant to not deduct TDS (applicable from 1 April 2019). TDS on Insurance Commission – TDS is deducted on insurance commission, if it exceeds Rs 15000 per financial year. However, insurance agents can submit Form 15G/Form 15H for non deduction of TDS if tax on their total income is nil (with effect from 1 June 2017). 1. Can HUF submit Form 15G/Form15H? 2. Can NRIs submit Form 15G/Form 15H? 3. Do I need to submit Form 15G/ Form15H at all the branches of the bank? Yes, you must submit one at each branch of the bank from which you receive interest income though TDS is deducted only when total interest earned from all branches exceeds Rs 10,000. 4. Does filing Form 15G/Form15H mean my interest income is not taxable? Form 15G/Form 15H is only a declaration that no TDS should be deducted on your interest income since tax on your total income is nil. Interest income from fixed deposits, recurring deposits, and corporate bonds is always taxable. 5. Will my interest income become tax free if I submit Form 15G/Form15H? Interest income from fixed deposits and recurring deposits is taxable. For senior citizens deduction of Rs.50,000 is available under section 80TTB for the interest income from fixed deposits/post office deposits/deposits held in co-operative society. You should submit this form only if tax on your total income is zero along with other conditions. 6. I submitted Form 15G and Form 15H but I have taxable income? You must intimate to your bank that tax on your total income is not zero. The bank will make changes and deduct TDS accordingly. Do report the entire interest income in your tax return and pay tax on it as applicable. 7. Do I have to submit this form to the income tax department? You don’t need to submit these forms directly to the income tax department. Just submit them to the deductor, and they will prepare and submit these forms to the income tax department. If you are a TDS deductor, the Income-tax Act requires you to allot a Unique Identification Number or UIN to everyone who submits a Form 15G/Form15H. 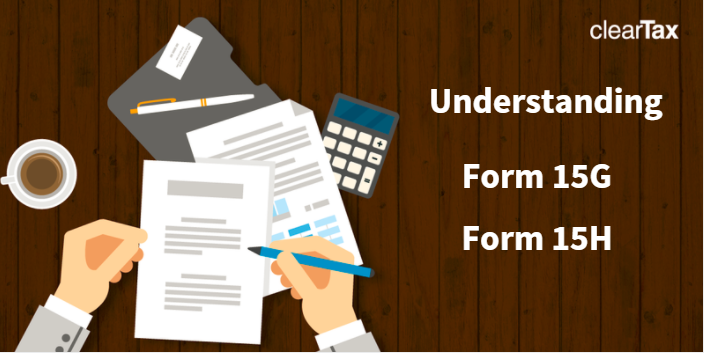 You must file a statement of Form 15G/Form15H on a quarterly basis and must retain these forms for 7 years. TDS on EPF withdrawal – TDS is deducted on EPF balances if withdrawn before 5 years of continuous service. If you have had less than 5 years of service and plan to withdraw your EPF balance of more than Rs 50,000 (Rs 50,000 effective 1 June 2016, Rs 30,000 prior to that), you can submit Form 15G/Form15H. However, you must fulfil conditions (listed above) to apply for these forms, i.e. tax on your total income including EPF balance withdrawn should be nil. TDS on income from corporate bonds –If you hold corporate bonds, TDS is deducted on income from them exceeding Rs 5000. You can submit Form 15G/Form15H to the issuer requesting to not deduct any TDS. TDS on post office deposits – Digitized post offices can also deduct TDS and accept Form 15G/Form15H, if you meet the conditions applicable for submitting them. LIC premium receipts – Effective from October 2014, if the amount received from a policy exceeds Rs 1 lakh and it is taxable, 2% TDS shall be deducted by the insurer before paying. You can submit Form 15G/Form 15H to request that no TDS be deducted since tax on your total income is nil. TDS on rent – TDS is deducted on rent, if total rental payment in a year exceeds Rs 2.4 lakh. If tax on your total income is nil, you can submit Form 15G/Form15H to request the tenant to not deduct TDS (applicable from 1 April 2019). TDS on Insurance Commission – TDS is deducted on insurance commission, if it exceeds Rs 15,000 per financial year. However, insurance agents can submit Form 15G/Form 15H for non deduction of TDS if tax on their total income is nil, with effect from 1 June 2017. Do not submit Form 15G, if your income has to clubbed with someone else. Interest income from an FD for a non-earning spouse or a child has to be clubbed with the income of the depositor. In such a case Form 15G is not valid. PAN of the depositor is mandatory and TDS should be deducted in the name of the depositor.